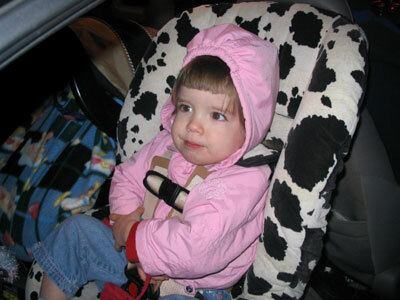 Jillian rear-facing in the Britax Marathon at 2 years, 10 months old and 30lbs. 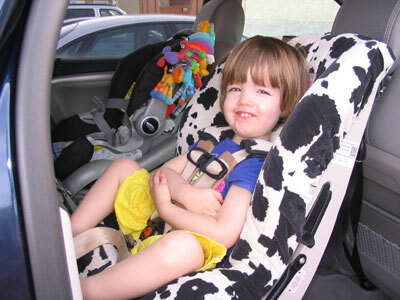 She had been forward facing from 18 months until 30 months when we turned her back around until she hit the limits of her seat. She had no complaints about rear facing and we had no difficulty turning her back rear facing despite being forward facing for a year already. For the first half a dozen car rides after being turned back forward facing this past May, she kept on talking about how she was riding backwards. Jillian in the Britax Marathon at 2 years, 6 months old. She weighs 28 lbs.